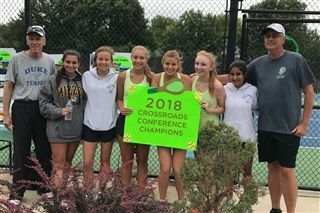 On Tuesday afternoon the girls tennis team sailed past Maranatha to become the 2018 XRC Champions. Earlier in the season the Lady Knights defeated the 2017 Kansas State Champions, KC Christian to take the inside track to this year's XRC title. The 2018 championship marks the first ever for the Lady Knights since the inception of girls tennis in the XRC Conference in 2017. The team also celebrated "Senior Day" at the courts on Tuesday. This year's seniors include Lauren Shore, Helene Bergere and Hannah Tadros. 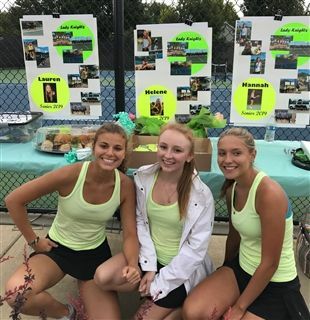 The senior led Barstow Knights carved another small piece of Barstow athletic history on Tuesday by wrapping up Barstow's first ever conference title in girls tennis with a 9-0 victory over Maranatha. The team secured this conference title fittingly on SENIOR NIGHT! Seniors Hannah Tadros and Helene Bergere kicked things off with a 6-0 win at #1 doubles, followed by a 6-0 victory at #2 by Senior Lauren Shore and her partner, Hope Leathers. The matches featuring the numbers 1,2 and 3 singles, were all 6-0 wins by Hannah, Lauren and Hope. Helene held down #4 singles with a 6-1 win and Arwa Rawjani at #5, and Mia Sabapathy at #6 singles continued their much improved play with a pair of 6-0 wins. The team officially earned the conference title on Tuesday, but took the biggest step towards the championship with an incredible effort and upset of KS 3A state champ, KC Christian two weeks ago. Congratulations ladies!